This plugin enables autosaving in your game. For RPG Maker MV 1.6.1. It allows saving on differnt situations like on entering a map or closing the menu. 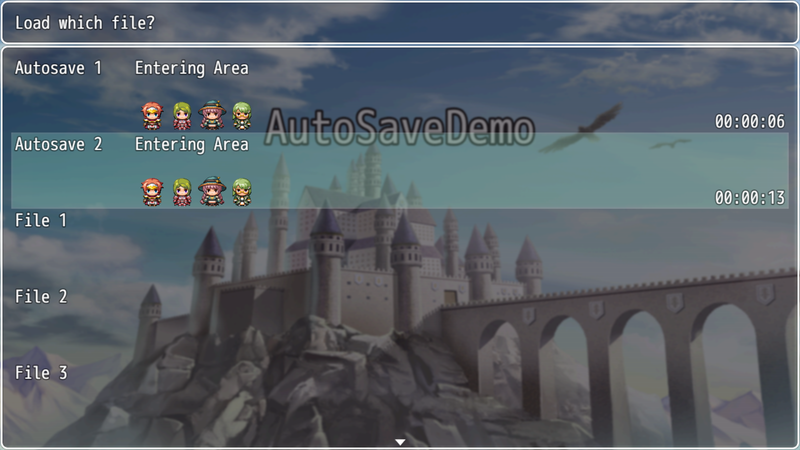 You can also save during eventing using the plugin command AUTOSAVE. Would I be able to prompt an auto save after a boss encounter? Is there any way to limit the number of save files to lets say one for each new game file? I've been looking for a save plugin for awhile that can limit the player to just one save file for each play through of the game and allow lets say fastest play through time be saved across all play through of the game. The best play time would be recorded as a variable and automatically saved as soon as the game ended, but then you could start a new save file and view the fastest play time and possibly the name of the player. This all seems very specific though. Let me know if any of the above is included or could be included in future updates. I'd be very interested.